1. Create an account using your Pacific email address. 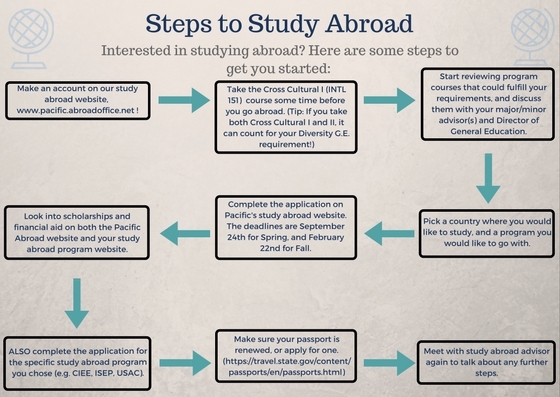 Even before you are ready to study abroad, it is beneficial to create an education abroad account so you can communicate with education abroad peer advisors, be invited to information sessions and presentations, and make the Education Abroad Office aware of your interest in studying abroad. Please use your Pacific email address to create your account. Once you create an account, you will be able to ask questions about program details and apply for a program. 2. Choose an education abroad program. You can search for a program by location and/or by your field of study. The clickable world map will show you all of the Pacific-approved programs in a specific continent and country. The Advanced Search tool on the left menu allows you to search for programs by additional factors, such as your major. If you would like to meet with someone for assistance in selecting a program, stop by and visit us in the Bechtel International Center, or contact one of our Peer Advisors to schedule a meeting. When you are ready to apply to a specific program, click Apply for that program. Common mistakes to avoid: All uploaded documents should be uploaded in landscape view so that the document opens right side up. Documents should be clear, legible and an appropriate size so that they are easy to read when opened. This means handwriting needs to be clear and ink needs to be dark. Please check your documents after uploading them. Once you have completed your Application Forms, the system will automatically notify IPS by email so that your forms can be reviewed. If your forms are approved by IPS, the system will notify you by email that you have been Approved by University of the Pacific, and you will then be able to see the Enrollment Form link in your account, under Online Forms. If the information in your forms is found to be inaccurate, incomplete, or cause for concern, IPS will contact you and you will need to resolve any issues and complete your forms properly by the above application deadlines. Normal processing times for IPS review of Application Forms is 1-3 business days. During peak periods, such as the month before IPS deadlines, processing times are generally 4-6 business days. It is highly recommended that you complete your Applications Forms at least two weeks before the above deadlines in case there are issues you need to resolve regarding the completion of your forms. 3. Complete your program's application by your program's deadline. In the My Applications area of your account, under Program Name, click on the link for your particular program. This will take you to the program's web site where you will find instructions to apply to your program. You should apply directly to your program and contact the program provider with any questions regarding its application process, course offerings, etc. Program application deadlines vary and some programs allow you to apply online, while others require hard copy applications. If you are unable to locate instructions for your program's application, please email ips@pacific.edu for assistance. Transcripts- order online or in person through the Registrar's Office. Financial Aid award letter, statement,or proof- Financial Aid Office. Advisor(s), Academic Advisor(s), or Faculty Advisor(s)- Your Faculty Advisor(s). Study Abroad Advisor or Exchange Coordinator- Education Abroad Advisor & Exchange Coordinator. 4. Complete Enrollment Forms BEFORE Early Registration Opens for Your First Semester Abroad. All Enrollment Forms must be complete before you are provided the override to register for your first semester abroad. To access the Enrollment Forms, log in to your account and click on Enrollment Form, under Online Forms. Note that you will not be able to see the Enrollment Forms in your account until your Application Forms have been reviewed and approved by IPS (International Programs & Services). *Note: Although the system automatically sends you an email saying your status has been updated to Enrollment Forms Complete, your Enrollment Forms are not considered complete until they have been verified as such by IPS. Such verification will arrive to you in an email from IPS explicitly stating that you have been provided the override for the SABD course. 5. Register and enroll in the SABD 000-01 course for your (first) semester abroad. Once you have completed your Enrollment Forms, the system will automatically notify IPS by email so that your forms can be reviewed. If your forms are approved by IPS, IPS will notify you by email that you have been provided the override for the SABD course. At that point, you will be able to enroll in the SABD 000-01 placeholder course for your (first) semester abroad. If the information in your forms is found to be inaccurate, incomplete, or cause for concern, IPS will contact you and you will need to resolve any issues and complete your forms properly before you are granted the override to enroll in the SABD 000-01 course. Normal processing times for IPS review of Enrollment Forms is 3-5 business days. If you have received email notification from IPS explicitly stating that you have been provided the override for the SABD course and you experience issues with SABD 000-01 enrollment, please contact the Registrar to ensure there are no holds on your account. 6. Enter your Contact While Abroad information in your account profile as soon as you have it.